NOUVEAU Playing Cards are inspired by the historical and mythological heroes and heroines traditionally featured in the French playing cards since the 16th century. The art style and design pay tribute to the philosophical and artistic trend Art Nouveau, promoted and popularized in France in the late 19th century. 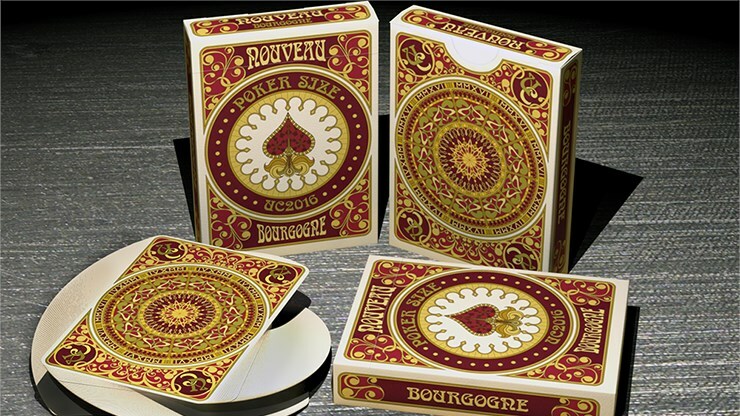 NOUVEAU, chosen as the official United Cardists 2016 Annual Deck, is a custom deck of playing cards (poker size) designed by Bona Fide Playing Cards and manufactured by Expert Playing Card Company. The Jokers represent Pierrot and Harlequin (both stock characters in the Italian Comedia dell'arte) popularized in Paris in the late 19c. Regarding the meaning of the suits, you can find just as many theories as for who the court cards represent. It was decided on one of the most spread ones regarding the original French suits, where Spades were believed to represent nobility, Hearts the clergy, Diamonds the merchants and Clubs the commoners and the peasantry. Art Nouveau is a style of decorative art, architecture and design promoted and popularized in Paris in the late 19th century and characterized by intricate linear designs and flowing curves based on natural forms.